Australia is famous for its unique, varied, and sometimes dangerous wildlife. During our five-month trip down under, we were fortunate to witness an incredible display of critters. We were thrilled to spend time with kangaroos, wallabies, koalas, wombats and all their cuddly marsupial relatives, but we were also blown away by all the animals that we had never heard of before…and you don’t have to go to a zoo or a wildlife sanctuary to see them! Wildlife warning signs are not just for show! Be careful on the road, especially at dawn and dusk. We had several near hits and many mornings there was sad evidence on the road that someone else did hit. Wildlife is EVERYWHERE in Australia…seriously! From our Australia home exchanges, we didn’t have to go very far to find something decidedly different. Sometimes, it was right there in our own backyard. We soon learned to expect the unexpected. For example: kangaroos on the golf course, eight-legged multi-colored starfish on a coastal hike, a frisky koala next to a diner parking lot (wide awake in the daytime, which is rare), a big water dragon who likes to lick painted toenails at the zoo, friendly butterflies, an emu kneeling respectfully to Tom, a large monitor lizard below our deck in Queensland, wobbly echidna, and wallabies on top of mountains. Sometimes you have to plan a little bit for a sighting with a short road trip or ferry ride. We made special effort if there was a good possibility for wildlife – a wary cassowary at Etty Bay, quirky quokkas on Rottnest Island, and Steve Irwin’s Australia Zoo. In Freycinet National Park, we took a wonderful day excursion with Wineglass Bay Cruises (we highly recommend them). We saw dolphins, seals, and loads of active sea birds. Most impressive were the huge albatrosses! Of course, the Great Barrier Reef will amaze you. Whether you see it by glass bottom boat, snorkel trip, or scuba diving, this is a must do. We had a fantastic time on the liveaboard dive boat “Reef Encounter”. Huge thanks to Scubabo for capturing photos of our experience, especially our flirty turtle encounter! Who knew we were such avid birders?! The birds are SO colorful here – and very LOUD – and their birdcalls are completely different from what we are used to at home. Huge flocks of brilliant cockatoos, lorikeets, corellas, galahs, and others are very fun to watch, plus huge pelicans and stone curlews with their fancy eyeliner. Kookaburras are heard more often than seen and never failed to make us laugh with their wacky calls! In keeping with Australia’s reputation for dangerous animals, there are plenty of creepy critters – bats, snakes, very big lace monitor lizards, large insects, and some scary spiders (but they all stay out of your way…mostly). We were amazed at how big and abundant the bats are. And they climb trees like monkeys – see the video! When is the best time of day to visit kangaroos? Australia has numerous zoos, wildlife sanctuaries and refuges. We visited a few and all were well done. We especially enjoyed the Caversham wildlife sanctuary near Perth. There, you get lots of animal interaction for one fair admission fee. 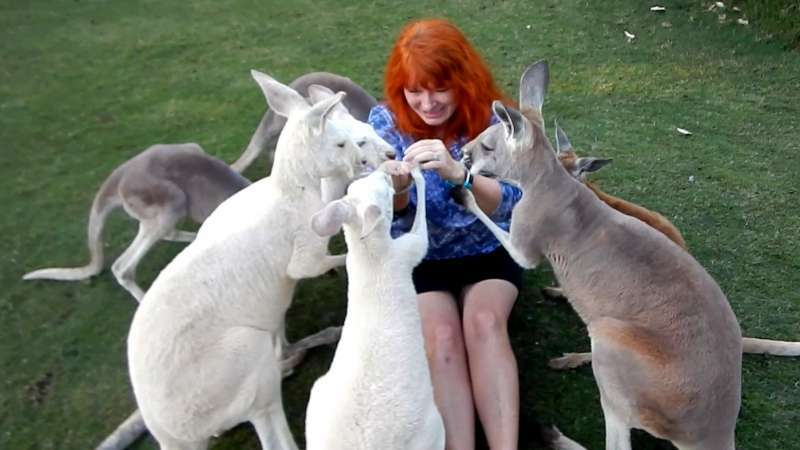 They have heaps of “tame” kangaroos and wallabies that you can hand feed. A word of advice here – wait until the end of the day when the sun is low and the temperature comes down – they become much more active and hungry – and the crowds are mostly gone. If you try to interact with a kangaroo in the middle of a hot day, you will likely find them fully reclined and uninterested or completely asleep. You can imagine how fun this was! If you love animals, you’ll want to put Australia high on your bucket list. Bonus: Aussie locals are super friendly! We’ll happily go down under again to see Australian wildlife and meet awesome people. There are some Aussie animals that we were never lucky enough to see (platypus) and some that we avoided in the wild (crocodiles – but we saw plenty at Steve Irwin’s Australia Zoo near Brisbane). New Zealand, Australia & Fiji plans!
? Where has wildlife been a big part of your holiday experience?